In his final address at the White House correspondents' dinner Obama lived up to his reputation as a top-notch jokester, making cracks about Republican front-runner Donald Trump and Democratic presidential hopefuls Bernie Sanders and Hillary Clinton. "You know I’m gonna talk about Trump!" 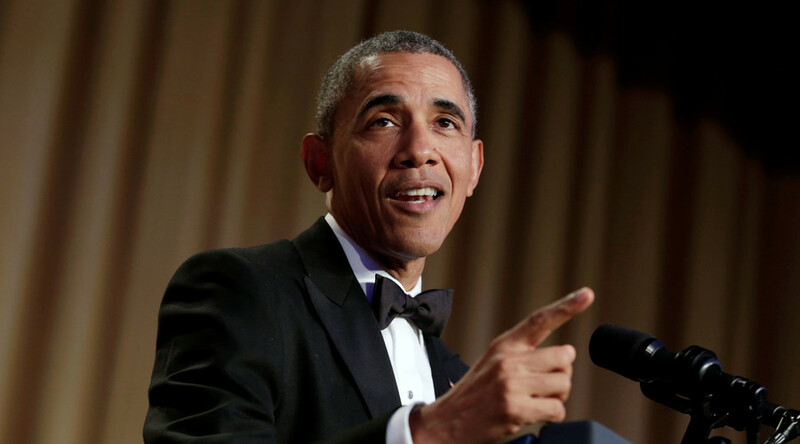 Obama told the crow of glitzy guests at the black-tie event that brought together journalists, media moguls, Capitol Hill power brokers and Hollywood stars. “Although I'm a little hurt that he is not here tonight. We had so much fun the last time," Obama said referring to the same event in 2011, during which Trump was present. This time around the billionaire businessman decided not to attend the event. “And it is surprising,” Obama noted. “You got a room full of reporters, celebrities, cameras and he says ‘no.’ Is this dinner too tacky for The Donald. What could he possibly be doing instead? Is he at home, eating a ‘Trump Steak’, tweeting out insults to Angela Merkel? What is he doing?” Obama wisecracked. "The Republican establishment is incredulous that he's their most likely nominee. Incredulous. Shocking." "They say Donald lacks the foreign policy experience to be president,” Obama said. “But in fairness he has spent years meeting with leaders from around the world: Miss Sweden, Miss Argentina, Miss Azerbaijan," he added, referring to contestants in the Miss Universe beauty pageant that Trump co-owned in the past. — The White House (@WhiteHouse) 1 мая 2016 г. "Bernie, you look like a million bucks. Or, to put in terms you will understand, you look like 37,000 donations of $27 each," the outgoing jokester said, referring to a zillion small contributions to Mr Sanders' campaign. "Bernie’s slogan has helped his campaign catch fire among young people. 'Feel the Bern.' Feel the Bern. It’s a good slogan. Hilary’s slogan has not had the same effect. Look, I’ve said how much I admire Hilary’s toughness, her smarts, her policy chops, her experience," Obama said. "You’ve got to admit it though, Hilary, trying to appeal to young voters is a little bit like your relative signing up for Facebook. 'Dear America, Did you get my poke? Is it appearing on your wall? I’m not sure I’m using this right. Love, Aunt Hilary.' It’s not entirely persuasive. Obama reflected on his more than seven years in office, saying he was “a young man, full of idealism and vigor” before he became president. “Hillary once questioned whether I’d be ready for a 3am phone call,” he went on. “No, I’m awake anyway, because I gotta go to the bathroom! I’m up,” the US president revealed. During his half-hour speech, Obama also made fun of his final year, when his approval ratings had been on the rise. “In my final year, my approval ratings keep going up. The last time I was this high, I was trying to decide on my major,” he recalled, drawing laughs from the savvy audience.